It's a Scrappy World: 4-21 New Saturday Challenge at Bugaboo Stamps! 4-21 New Saturday Challenge at Bugaboo Stamps! Today, I am taking my daughter to the hyper-stressful STATE Science Olympiad Competition! She and her partner are the youngest participants on their team, but they have worked so very hard to make it past the local and regional events! I am so proud of them both! Thank goodness I have this artistic outlet for my stress, especially since I homeschool my daughter (meaning that I teach her at home myself, and have to find my own resources to educate her to National standards, as well as have to teach another child to the best of my ability). It has been such an enriching. and wonderful. organic experience! I only ask that she will do her very best as this is an extracurricular experience that she has chosen to do for the second year in a row. Last year she earned a Bronze Medal at the end, and so far this year she has earned a Silver Medal. This is in addition to learning her core subjects, taking an art history class, playing the drums in her band, learning advanced Spanish, AP Chemistry, working towards her Silver Award with the Girl Scouts, trying out for various dance and theatre productions, and being an officer in the Key Club! My girl is a busy, self-motivated young lady - all I have to do is try to keep up! 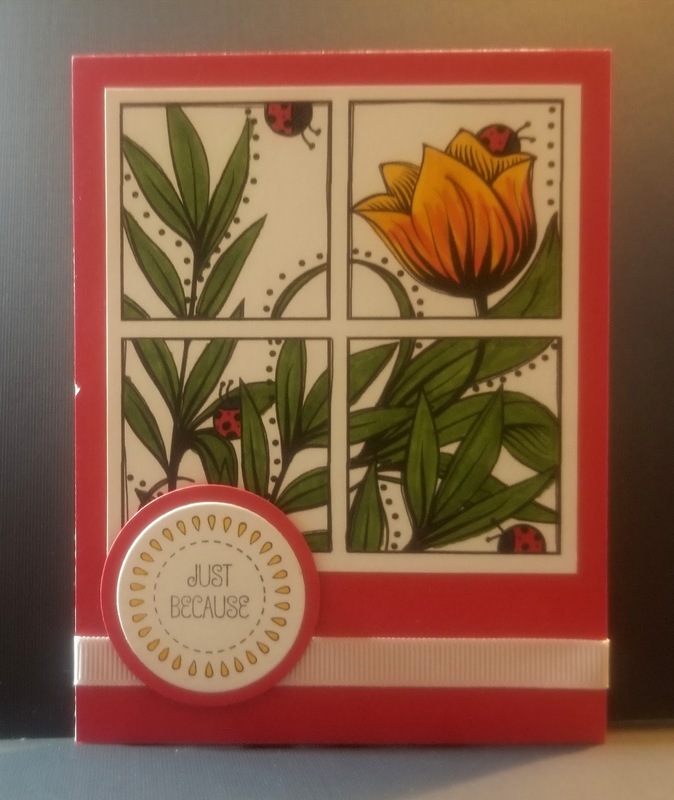 The card below I created using Bugaboo Stamps 4 Block Tulip Square. It is such a beautiful Digi, and I couldn't resist using it to play along with Bugaboo Stamps Bingo Challenge today! I used the Diecut/a Bugaboo Image/Ribbon line on the board. I hope you like my card and play along with our challenge! Check out the other DT Members awesome creations HERE, and please be sure to comment!